You know what comes with age? Silver highlight on your hair and hard of hearing. Which I am sure are what most people referring to as wisdom and grace. This year, I am turning Four-Zero, and I will become a legend because my sexlessness seems to inspire a movie. In any case, what also comes with age is the fact you began to see how history repeats itself again and again (ad nauseam). When young folks were only starting to be disgusted by human nature for the first time around, I began to see no evil, say no evil, and hear no evil, as I know too well what's coming. The smile on my face upon hearing aggravating political events is not that I am grace on the margin of being aloof, or wise to the point of condescending, but more like if your boss is being unreasonable again, let's shrug it all off to nirvana, because what else can you do? How glamorous right? I don't mind you complimenting my wisdom and grace, or is that my hair and my selective listening skill you're referring to, but a better compliment would be check my ID again when I am buying an alcoholic beverage. It's wonderful to be young again, even if it's filled with angst. The very idea of exploration of this world for the first time is just so refreshing. I am just a simple folk like that. What really inspires me to ramble today is because my fourth decade milestone is making me childish again (not really). I won't do some self-destructive behavior such as buying a Porsche and happily pay for the speeding ticket. I am too Taurus to do that. Okay, so what really make me ramble today is because 1) I am gay, 2) I went to Target today (pronounced Tar-JAY, like any French with self-respect would do, except I am not French), and 3) I am about to hit forty years-of-age (which is about 107 in gay years citation needed). I am going to explain what I mean (you don't have to ask, because I am sensible like that). I don't know if you frequent REDcard™ carrying, Cartwheel App abusing Target shoppers have noticed, Target employees belong to a couple of genres (roughly). They either are outcasts, which back in my high school years, were those kids who worked at movie theaters with pimples (who I loved dearly, but high school kids liked to judge), OR they are gay (either openly or in naive stage, because dying hair pink is totally not gay but a mode of self-expression *wink wink, nudge, nudge*). The latest Target Boy I am focusing on is way too beautiful that pimples refuse to tread on him, so I'd have to assume he's gay until proven guilty. I am going to describe what TB3 looks like (again, you don't have to ask the embarrassing question. See what a gentleman I am?). His hair is blond, meticulously groomed to have that unkempt look. The wavy bang, like The Great Waves off Kanagawa, hovers over his forehead as if it can defy gravity. If he were standing outside, the bang was long enough to cast a shadow in 11 o'clock sun. 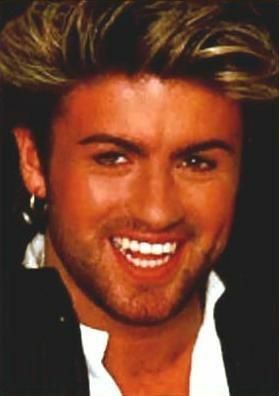 His facial feature is a cross between young George Michael and Jesus Christ look (if that makes any sense to you), and his angular jawline was carpeted with short dirty blond beard. His eyes are electrifying blue. You can't miss him out of an ocean of generic looking Target employees. I have a habit of making REDcard™ payment in store, typically a week day and late evening to avoid a long line. It used to be a gender queer boy/girl who took my payment, who is coy around me and very sweet. One day, TB3 just showed up in that place. It must be his first day of work because you could literally see his hands tremor and his eyes dilated around me. He had a hard time making the proper change when I paid payment in cash. I had to tell him how much to give me back, and remind him what's the proper procedure (take the receipt and staple it to the credit card statement). He is either bad at basic arithmetic or he is just happy to see me. You could tell he is from a good family, but due to recent financial distress he now found himself a need to work; too common a story in this area. Today, a month later, I am there to make payment again. I was hoping to see him but at the same not a deal breaker if I don't. After all, the boy is high school age or Freshman in college and not someone I want to have a relationship with, even under my current situation. I just want to see how well he adapts to Target. You see, I used to work at a retail environment as a supervisor, working with kids on average ten years younger than me. Coincidentally I am currently being a trainee at a location that's not my typical station of duty. Not to mention my worst crush ever is a Costco Boy and I literally witness his up and downs over the years. I only want to see young folks thrive. I was in mischievous mood. I wanted to pick up a copy of Simon vs the Homo Sapiens Agenda, the novel Love Simon is based on. I wanted to ask him if I am too old to read young adult novels, just to see his reaction. After all, that movie, at least based on trailer, is about a high school boy coming into term of his homosexuality. Given how self-conscious he was every time I saw him, it might help him somehow, even if I was not the intended audience. I did not do it, however. I know when I was at that age, I was easily agitated due to angst and for a boy still trying to come into term with their sexuality, it may not have a positive consequence as intended. I certainly don't want him to think I am coming onto him. Instead I was just making a bill. I gave him a hundred dollar bill today and again, he was nervous around me when I thought he had done a very good job with the prior customer. He made some very silly mistakes when I told him I would like to pay my bill off, he thought I wanted to make $100 payment and I had to point out the pay off amount is on the bill. He was just super nervous and I swore his beard was 1/4" longer today than the last time I saw him, and his jaw fur had been perfect. His hair bang was still defying gravity and meticulous curled with a hair straightener I think, but telling another person to trim their beard to a certain specification might be a little too much. I know how much a retail job can be exhausting and make you stop caring how you look. Again, his beautiful blue eyes were dilated, as if he went through the whole war zone, so I left him in peace.